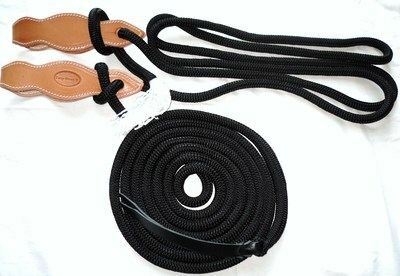 The reins are made from a top quality 13mm diameter doublebraid yachting rope and are 22ft long. Please note that the slobber straps no longer have the logo as in the photo. As an alternative you can have them with metal conchos of either stars, horseshoes, or a running horse. Please note that if choosing the running horse concho the nearside slobber strap will have the horse facing the rider and the offside one facing away. The slobber straps are positioned so that you have reins of approx. 9ft, with the rest as a rope line which attaches to your saddle. The slobber strap can be adjusted to give you longer or shorter reins by sliding it along the rope. Available in a wide choice of rope colours.